As of late I have honestly found it so hard to get stuck into a book but this one took me by surprise. Generally I tend to stay away from the Historic genre as it's just not my cup of tea but i'd been hearing people rave about this and decided to give it a shot. Boy was it worth it. I think the thing I usually have a problem with is the writing as it tends to sway to an old fashioned tonne which I don't like but this wonderful masterpiece made me forget what time it was actually set in. The world building is phenomenal and I could not put this down. The writing flowed nicely and I found there was rarely a dull moment to be found. My favourite scenes were the ones with Audrey and Thomas, the banter between the two of them was on point and I was constantly giggling to myself. I am sure I sounded like a mad woman haha. 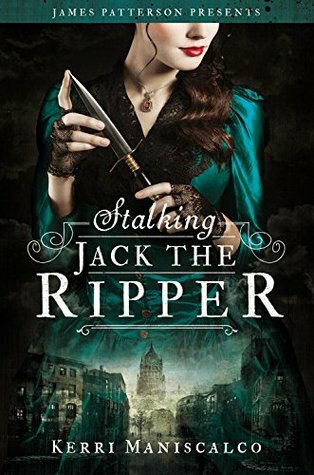 I loved how Kerri interwove true historical facts about Jack the Ripper into the story it made it feel all the more real. Audrey's character is one I have to say is now in my top 5 female characters. She is strong and independent, never did I feel like she was needy or annoying like many lead characters I could name. When Audrey's father told her that she could no longer be her Uncle's apprentice, I admired that she refused to listen to society telling her how to be and instead followed her passion even if that meant disobeying her father. I can't wait to follow on with Audrey's story as it is obviously far from finished. You might be reading this trying to figure out "who is jack the ripper?" well you'll just have to read the book and find out. Seriously go pick it up! !